I’ve read 10 books to my students this past 2014-2015 school year. I asked them to let me know which book(s) they liked the most. 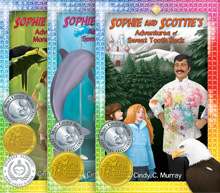 Almost all of my students liked Sophie and Scottie’s Adventures of the Monarch Mystery and Sophie and Scottie’s Adventures of Something’s Fishy the best!